The 2011 has come and gone without much from McChoppin, but not before we had another winter campout. 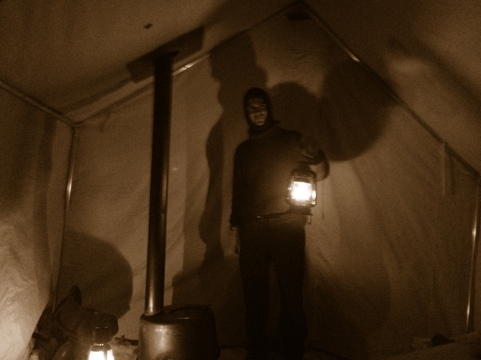 The 2011 Winter Campout: it was significantly different than all previous years. Never had we had a tent; this year but only did we have a tent but it was a large canvas tent. Now we normally don’t bring a tent, not because they are hard to carry, but because we are slightly crazy. But this tent, compared to most, isn’t exactly that portable. No matter, because another change for this year was that instead of hiking into public woods to miles, we camped at the Slickman’s new property in NH. The hike in, although it was uphill, was all of 100 ft . Having a tent and not having to hike in totally changed the whole dynamic. Not only did this mean that we weren’t cold and miserable all the time, just some of the time, but also it meant we had a lot more time. A whole lot more time. In years past when it would get dark at 4:30, we would be cold, miserable and in the dark. So by 6 you’d be in your sleeping bag, still cold and miserable, but less so. Not this year! This year with the tent and some Deitz lanterns so we could happily stay up well into the evening. So what did we do all that time? Well, we black smithed, hand hewed a timber, and built a lime rick. Again, since we didn’t have to hike in miles and we could bring whatever we wanted. That meant a stove, a forge, and more axes than ever came along. Oh, and a duffel bag full of savaged sea shells for the lime rick. So we set out to forge square nails, hew a timber with a board axe, and make lime from shells. Considering this was our first attempt at any of these projects, I think we did fairly well. The timber still needs some work, but Lee did make a couple good nails and we had something that looked like lime in the end. And the best part? They’ll all end up being used in Lee’s timber framed house that he is building on the land! Also this year we were much better stocked in general. For food we had buffalo steak medallions and beef sirloin tips in addition to old staples like oysters, kipper, cheddar and pickled beets. Somehow everyone forgot to bring a can opener, so the cans of beans proved useless. We also had a case of the Slickman’s homebrew, which somehow got polished off, in addition to two bottles of whiskey. 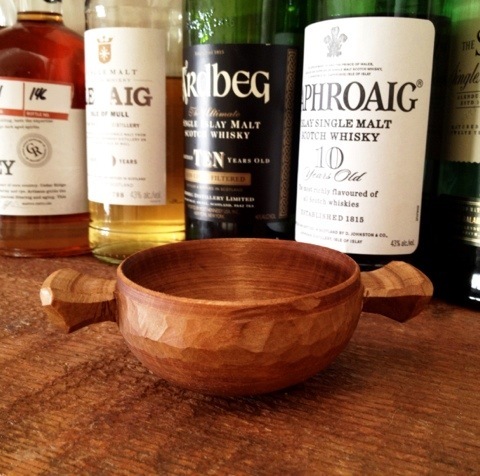 The Scotch, Scapa, was the favorite and this year we had a special vessel in which to drink it, a Robin Wood quaich. As some of you know, Robin Wood has inspired many a McChoppin’ project, so this was a special treat indeed. We raised the quaich to you, Robin. What will the 2012 Winter Campout hold? Can we go back to no tents and being cold and miserable constantly? I hope we do at some point, but who knows? Maybe next year we can secure ourselves an open wooden boat, a la James Caird, and have a winter campout on an island. Now that sounds like a Shackleton adventure. I’m pleased to see that you enjoyed your winter campout this year. Despite ingrained Ben-inclinations of camping authenticity (in its difficulty) it is a-ok to be in a nice tent & not be miserable. Good video and even better editing (which I tend to be stingy about). Hope you make it to the boat in 2012.